The Missouri Irish Brigade of Civil War Reenactors is a Northwest Missouri - based Civil War living history organization founded in 1995 to portray the Irish and western federal soldiers of the often overlooked Missouri Irish Brigade. Our field impression is of the Consolidated Battalion 7th and 30th Missouri volunteers, a veteran unit as it appeared during the fall of 1864. Interested in becoming a Civil War reenactor? 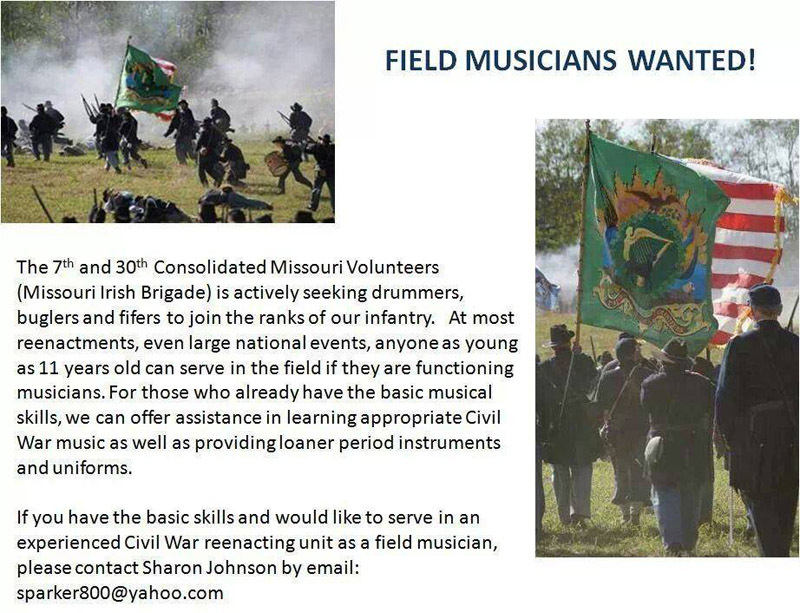 The Missouri Irish Brigade is actively recruiting new men to its ranks. Please visit our Recruiting Depot if you are possibly interested. The Missouri Irish Brigade has monthly unit meetings on the last Thursday of each month. These meetings rotate between the homes of various MIB Members in the Kansas City area. Please contact the MIB Captain for the location of this months meeting. These meetings are usually open to the public, and if you have an interest, then we encourage you to come and meet the Pards. Meetings start at 7:00 p.m. and last only about an hour. The Missouri Irish Brigade is working on plans to start raising funds for the preservation and restoration of the original 30th Missouri's national flag. It is currently stored in Jefferson City at the Capitol museum. We are also looking into the possibilities of a permanent memorial to the original Brigade. With your support, we can make it happen. We are also working on establishing our very own Regimental Sutler. Once open, you will find some great gift ideas for your favorite Civil War or Irish Brigade enthusiast, while at the same time supporting our historic preservation and living history programs. We are proud to be a member unit of the U.S. Muddy River Battalion, an organization of several authentic reenactment organizations across western Missouri and the Frontier Region.